Children's Hope International: Orphan Sponsorship in Ethiopia Launches Today! Orphan Sponsorship in Ethiopia Launches Today! 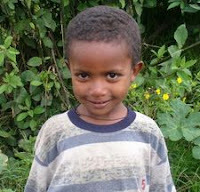 Amha is one of many orphans in need in Ethiopia. He is a very strong boy, and he eats whatever he is offered. He loves his mother very much and since the death of his father, he follows her everywhere. Most of the time he prefers to be with her rather than playing with other kids his age. His single mother supports him and his four siblings by selling items at the market. Today, Children's Hope is launching Ethiopia's orphan sponsorship program; and Amha has found a sponsor. His family will receive medical supplies, opportunities for education, and much needed food. Now you can sponsor a child much like him. Visit Children's Hope orphan sponsorship website at www.HelpAnOrphan.org to see how you can make a difference in one very special child's life.